How ironic... or something resembling irony! 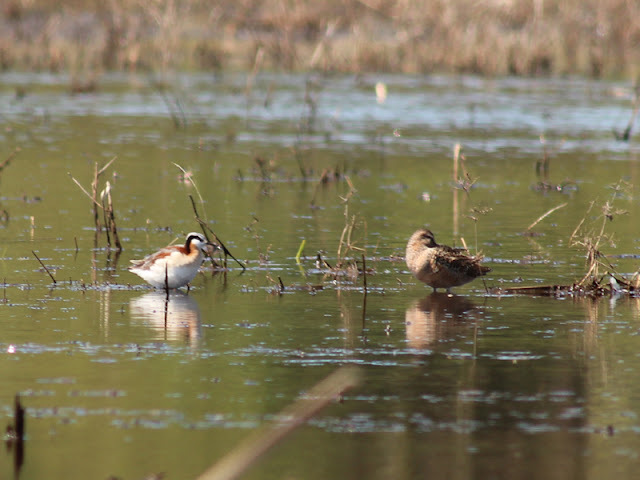 On International Migratory Bird Day, two species decided to show us they are not so apt at finding their normal range. I woke up early this morning after getting to bed earlier than usual last night, so I opted to go for a walk at Saanichton Spit. The spit was deader than I've seen it in ages, so I decided to make tracks and head out to the airport. I had nearly finished my circuit around the airport when I made one last stop just east of the terminal. I scanned out over the fence lines and fields and noticed a hawk low over the field. I thought "Hmmm... that has quite the dihedral going on!" 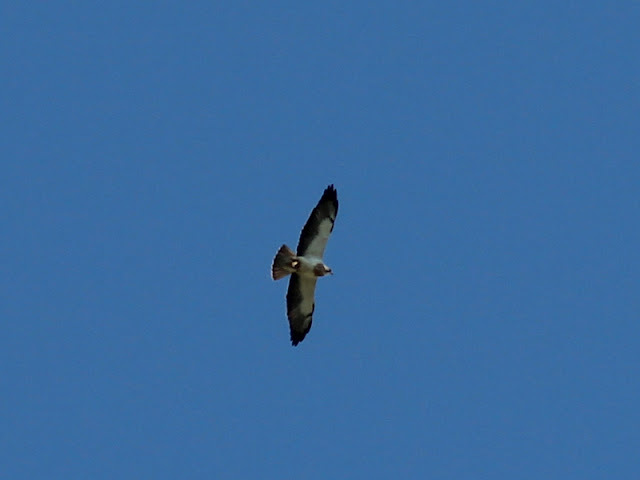 When it banked, it showed black primaries and secondaries - it was a classic light phase Swainson's Hawk (Buteo swainsoni)! I hopped out and put it in the scope and saw other key features, such as a brown hood, a clean white chest, and a sandy grey-brown back. I even watched it dive into the grass a couple of times in hopes of snagging a vole or a snake! I called up Jeremy K. and he was in the exact spot he didn't want to be at that moment, which was smack dab on the top of Mount Wells. He booked it down the mountain, met me at my place and we zipped out to the airport, which ended up being a shade under two hours since I last saw the bird. We pulled over at the spot I had originally seen the hawk and started scanning - is it that one? Nope... Red-tailed Hawk (Buteo jamaicensis). That one above it? Nope... another Red-tailed Hawk. How about the one over the control tower? Yes! We watched the light phase Swainson's Hawk wheeling around over the fields for a couple minutes before noticing another interesting dark phase hawk. It had several features in line with the light phase, but its chest was uniformly chocolate brown. When it banked and showed its back, we could see it was the same sandy grey-brown colour as the light phase's and it graded abruptly stopped at the blackish primaries and secondaries. 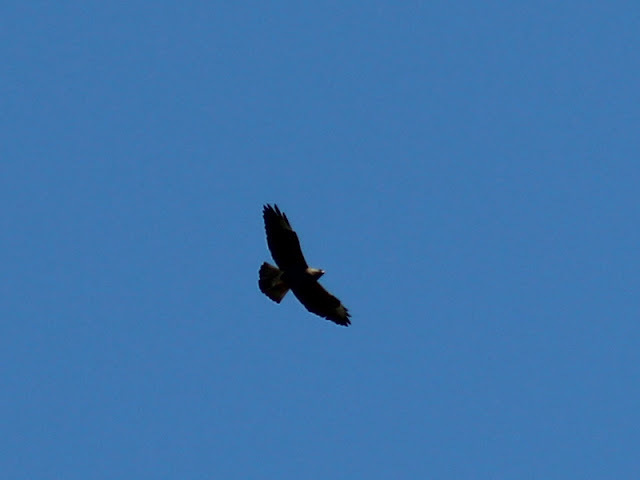 Additionally, the tail didn't have a trace of rusty-red like any of the dark version of Red-tailed Hawks. 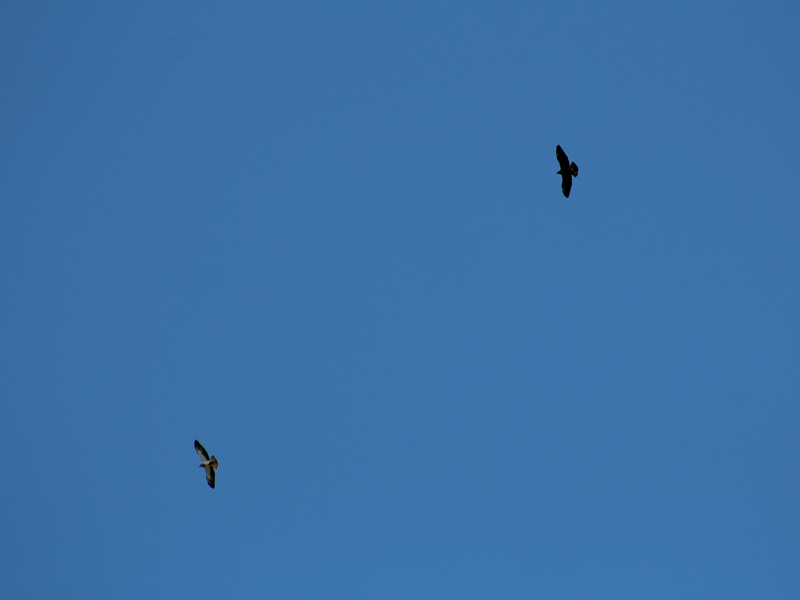 After watching it for a while, we were quite certain it was another Swainson's Hawk! Below are pictures (not great) of the two different Swainson's seen today. Light phase Swainson's Hawk - no doubt about this classic bird! I managed to capture the light phase and dark phase Swainson's in the same frame for comparison - awesome! We continued on to the Vantreight bulb fields where things were slow, then Jeremy K. abruptly said "We have to go!" I thought that was a tad urgent, but I knew he had early afternoon plans. He then clarified by turning his phone to show me a message indicating there was a Wilson's Phalarope (Phalaropus tricolor) at Panama Flats. We turned tail, hopped in the car, hit the highway, and made our way out to the flats. 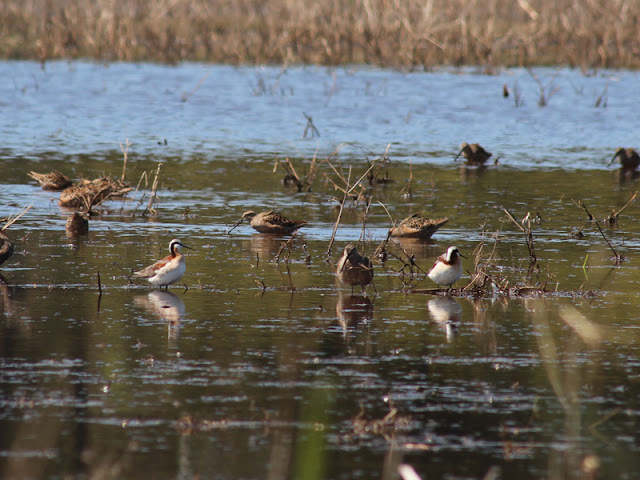 We luckily picked the right corner of the flats and were soon looking at two female Wilson's Phalaropes! What a great day of birding with two species normally found in the interior of the province! And two of each to boot! Female Wilson's Phalaropes exemplify a rare case (aside from humans) where the females are more striking than the males. Their mating system is polyandrous, which means there is a role reversal where males perform most of the parental duties while the female competes for mates. Right up there with our best days last year! Great find on the Swainies!